Across the country, many families are struggling with the same difficult question: How can you best support aging family members when you live in a city with minimal housing options? Best Practice Architecture has offered a brilliant solution to issues around multigenerational living and urban density with their latest Seattle project. 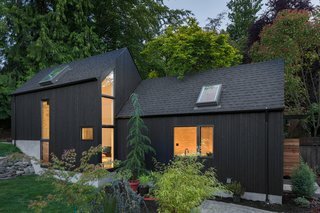 The firm was hired by a Seattle homeowner to create Granny Pad: A spacious living quarters converted from a backyard garage. The residential addition was built to give the aging family member a safe and well-designed home, bring childcare to the growing family, and to maintain privacy for everyone involved. Located just north of Seattle’s University District, Granny Pad is a 571 square foot detached dwelling transformed from an existing garage into a lofty, open living space. The project began when the client couldn’t find appropriate housing for “Granny” in their neighborhood. With a growing family, they didn’t have enough space in their house to accommodate her needs and maintain the privacy everyone in the family wanted. And with a shortage of affordable housing in Seattle, the option of moving to a larger house in the city was out of reach. That’s when Best Practice stepped in. The firm saw converting the client’s existing garage (previously used as storage) as the perfect solution. Design considerations included looking at the project on both a short-term and long-term timeline. First, Best Practice needed to address the immediate needs of the client. They also considered future uses of the space as a possible rental unit, studio, office or other income generating project for the family. And they needed to do all of that using just 571 square feet. To accommodate the decreased mobility associated with aging, the living area needed to be one level. Rather than make several small rooms, the team opted to create open, central spaces that can be easily adapted to changing mobility issues. Carefully placed windows and skylights provide lots of daylight. Rafters were left exposed in the ceiling. The existing garage door was removed, and the old structure became the entry, kitchen and sitting room. A short walk through the entryway reveals the bedroom, closet with laundry and bathroom. A lofted space above the bathroom (accessed by a ladder) will be used as storage for the time being, but can easily be transformed into an office or sleeping loft in the future. All of these details come together to create a soaring, open feeling that makes the relatively small footprint of Granny Pad feel much larger. Behind the structure sits a private back deck which connects to the loft space. The yard itself had a natural 6 foot elevation change when Best Practice began the project, which inspired the firm to build Granny Pan into the hill itself. And the bunkering made the loft an easy—and natural—addition. With unique and forward-thinking design, Best Practice was able to provide their client with the perfect solution for their current housing needs and a world of possibilities for their future. uploaded Granny Pad through Add A Home. To accommodate the decreased mobility associated with aging, the living area needed to be one level. A short walk through the entryway reveals the bedroom, closet with laundry and bathroom. Rather than make several small rooms, the team opted to create open, central spaces that can be easily adapted to changing mobility issues. Carefully placed windows and skylights provide lots of daylight. Rafters were left exposed in the ceiling. A dutch door completes a hallway leading Granny through her space.